We love drama in our images. Balboa Park in San Diego, and particularly the Prado, lends itself admirably to getting dramatic, beautiful photos of our wedding couples. 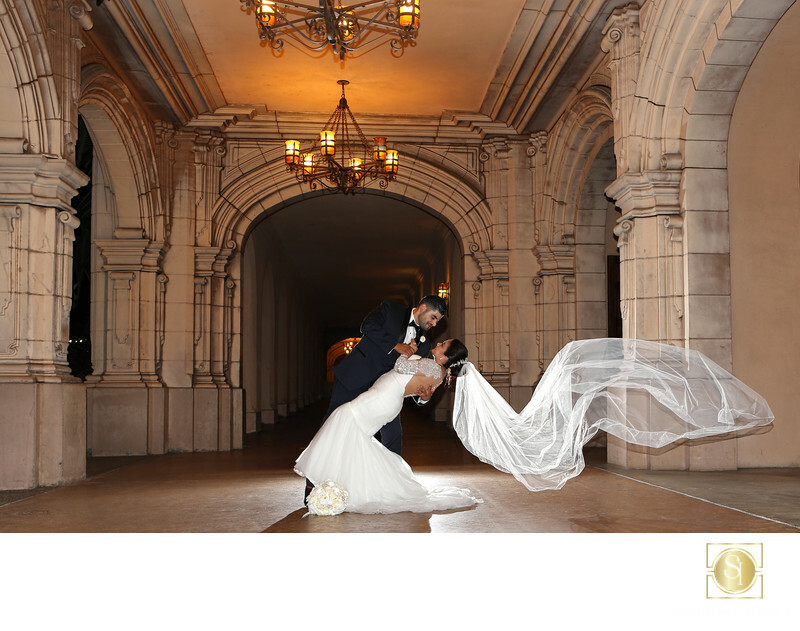 This one is an example of one of our favorite styles, back lighted and with beautiful surroundings, with a flowing veil. Since Canon upgraded their flashes a couple of years ago, it has become easier to get back lighting without the fear of bulky lighting equipment getting in the shot. A little camera flash on a small stand behind the couple gets better results than our old, big, bulky studio lighting we used to have to use. Location: The Prado, San Diego, California. Keywords: Balboa Park Wedding (21), Prado wedding photographer (6).